Most all insurance companies do what is called steering and is completely illegal but unfortunately even having gotten a slap on the wrist the insurance companies still practice this on a day to day basis. Steering and DRP’s are one in the same. If we didn’t have DRP’s there would be no steering and if there was no steering there would be no DRP’s. It is very important to know the information I am about to share with you and it’s even more important that we share the info with others so that we can grow the awareness of these malicious practices. We will start off by sharing a video with you created by a group that’s sole purpose is to stop DRP’s and in the process, stop steering. There are many organizations that are set up to inform, and educate the public because that is the only way we can truly stop this crime from being perpetrated on us all. I know what some of you are thinking right now: “If it was really illegal they would be charged” Well that would be the fact of the matter if we lived in a just world but in fact we don’t. Read our article about steering and you will find out that the insurance industry was charged and was told not to do it anymore but now they just changed their terminology and still continue to do it as before. So What Exactly Is A DRP? 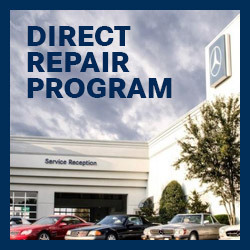 DRP stands for Direct Repair Program. These are programs set up by the insurance companies for body shops and collision centers to be in bed with them. The insurance companies promise to send the shops more business as long as they are willing to play by their rules. The rules always involve cutting corners and saving time and money. The more corners the collision center or body shop is willing to cut the more business the insurance company brings them. These programs are sometimes called “Network shops” or “Select Service” and the shops enlisted in the programs are commonly referred to as “preferred”, “recommended”, “network” or “selective” shops of the insurance company. In no way should you be under the illusion that these shops go on the list because of quality. I’m not saying that those shops are not capable of quality but that is not the reason they are on the in list with the insurance company. If you come in off the street with cash to repair your vehicle these exact shops that cut many corners to be on the DRP list will many times perform very well and will do things right. It’s only when the insurance company is involved and has referred the customer that they jump into this shady type of place that is there to save money for the insurance company and they are not there for you. Insurance companies put in so many many rules and regulations for shops who are on their “list”. Sometimes the insurance companies force shops owners to do things that they would not normally do. Cutting Corners: Using methods to speed things up at the cost of quality. After Market Parts: Using after market parts (every time) even if they don’t fit. Repairing Parts: Repairing parts that should be replaced or using used parts. Cutting back on paint time: Highly reduced paint time, cutting corners. Cutting back on paint: They will use less paint material for the project. The list goes on and on and on. In the future look for an article that I’m going to create that basically outlines every single factor that is affected when you have shops working for insurance agencies rather than customers themselves. Company slogans and creeds of conduct when dealing with the insurance companies referrals. Direct Repair Programs these insurance companies put in place are not for the benefit of the consumer. They are created for the insurer to maintain control of the repairs, price, fix, and keep their costs to a minimum and maximize their profits. Through these agreements, many claims are paid out at far less than what you, the insured, should actually be payed. DRP shops are “graded” on how fast and cost effective the repairs are done; quality too often takes a back seat, and become treatment only walk in customers get. Some of these agreements also state the shop must pay for your “extra days” of rental if they do not have the vehicle repaired in the time the insurer thinks it should take. They have this in place for the shop to basically have a hot potato on their hands that is speedily sent through their process for sake of the insurance company. You should ask your self the question if you would like your repair’s quality to be sacrificed for sake of saving the insurance industry money. Ask yourself if you want your vehicle repairs potentially compromised because the shop has to rush the job or suffer by playing a numbers game with the insurer. Are these the principals you want your collision center to abide by when repairing a family vehicle? You will find that insurers are not warrantying anything. The shops are forced by the insurance company to behave a certain way with repairs and then on top of that they have to insure it themselves. That is why in many cases you will find a body shop flat out lying to the customers and saying “that’s how it’s supposed to be” or whatever. In the event that your vehicle is a total loss, these DRP companies behave a totally different way than if you would have just come off the street. They cannot actually tell you how much your vehicle is worth and can loose their DRP status if they discus with you in any way the value of your vehicle. The insurance company will then low ball you and hope you take the bait where a normal body shop might advise you better on what to do. DRP shops do not work for you! They work for the insurance company that tells them how to behave. The quality of work will always suffer in these body shops compared to an auto body shop that has codes of conduct to uphold. They cut corners and repair parts that should be replaced. You do not want knock off parts on your vehicle. You want original OEM parts. The parts you have from the actual factory are far superior to the parts they will get for yours. Honesty is a virtue that these shops will not have because they are puppets on a string. The insurance companies don’t care about the body shops liability. If you are in an accident or get hailed on you should not listen to your insurance company about where to take your car. Instead rely on word of mouth, call a friend or go online and look at body shop reviews and find yourself a shop on your own. You will be better off looking into a few places and talking to the owner and seeing what they are about before you trust such an asset as your vehicle to one of the shops. We deal with many body shops and collision centers and can point you in the right direction if we cannot personally help you with your situation. Once again ff you find yourself in a collision or motor vehicle accident, DON’T let your insurance company decide where you send your vehicle! The Direct Repair Program is in place to make and save money for them and has you last in line. Don’t say I didn’t tell you so if you end up with a shoty repair and no help you go to try to reconcile the efforts of these places. They will make you feel like an idiot if you call them on their bad repairs. Find a body shop you can trust. Ask family and friends for recommendations, or look up reviews on Yelp or Google or other favorite search engines. If you really want to be sure you’re getting quality, contact your vehicle’s dealership and ask them to recommend a body shop. NEVER take your vehicle where the insurance company sends it. You have the right to decide where your vehicle will be repaired, and you can inform the insurance company of your decision. So you’ve done your best to find a body shop you can trust, but no dice! No one has any recommendations for you, and you end up taking your vehicle to the “recommended” or “preferred” body shop. How can you ensure that your repairs are done properly, using the best parts, and guaranteed to leave your car in the best possible condition? Are you doing the repairs for me or the insurance company? Who do you work for? me or the insurance? What parts will you use on my car? I only want OEM parts. Are you going to cut corners? I’m going to double make sure the repairs are ok by bringing it to a second professional so be sure to do the best possible repair. Are you doing the repairs to meet the insurance company’s standard, or to ensure my safety? — If they’re doing it for the insurance company, they have the wrong priorities! Will you use OEM (Original Equipment Manufacturer) parts on my vehicle, or will you use aftermarket parts? — Aftermarket parts are essentially counterfeits, made with inferior design and materials. Dangerous! Will you be repairing parts that should be replaced? — Fast work doesn’t always mean quality. Repairs to the body (the visible) won’t address structural damage. Are you planning to meet the insurance company’s deadline for the repairs, or will you work until the vehicle is properly repaired? — Definitely the latter! Faster isn’t better. Asking these questions will help you to evaluate the body shop’s true objective, and will make it easier for you to decide if they are the body shop for you or not. Here are some more videos to better help you understand this whole thing. 0 Comments on "DRP Direct Repair Program"